If you are organizing a lot of seminars, talk, conference, forum or workshop for your company? You will know the amount of works and time involved – from sending invitation email, tracking event registration, payment, sending reminders to participants and finally collecting feedback. That is a lot of works just for one event. In addition, you could be relying on many different software to accomplish your multiple tasks which are time consuming, tedious and error prone. In this article, we are going to see a better way you can streamline and manage the whole event planning process and get your tasks done more efficiently and effectively with just one software – Event Registration from Constant Contact. 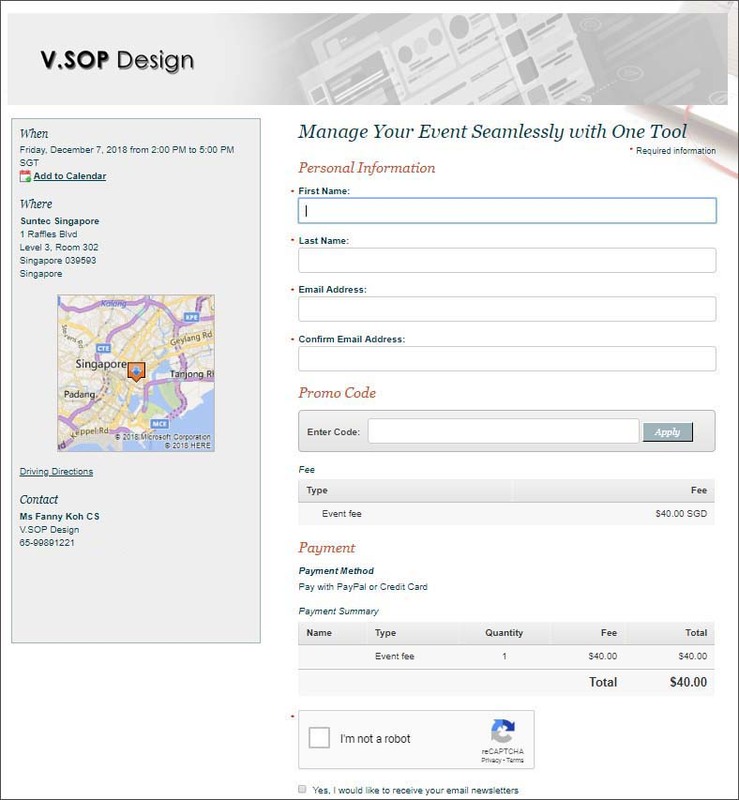 In addition, this software has other functions including email marketing, online event payment, event registration tracking and survey – all rolled into one. In short, you do not need to subscribe to different software to get your event planning and registration done now. To test drive, you can sign up a trial account at Constant Contact and start using their event registration form free for 60 days. Once you have signed in and logged into the trial account, you can click on the “CREATE” button to create a new event. As you can see in the screen below, the registration form, event landing page and email registration notifications templates are already set up. You will be guided step by step to fill up the essential event information so that you will not miss out any important details. This helps to speed up the process and reduce unintended error. The online registration form allows you not only to collect personal and business information, you can also add in custom fields to collect other information that your company need from the event registrants. 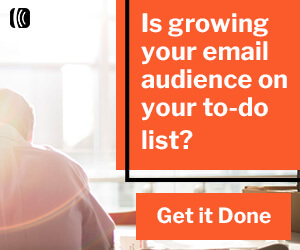 Once the registration form is set up, you can import your mailing list and send an email invitation to invite your customers to sign up at your event landing page. Alternatively, you can share the link of your event landing page at Social Media channel and encourage customers to fill up the registration form. You do not need to design the event landing page from scratch, the system already have ready-made event landing page template for you to use. The best part is the event landing page already pre-populated with all the essential information you have entered earlier such as the event title, date, time, venue and contact that you have entered in the previous step. It will automatically add in a Google map for you so save you the hassle of finding the map code and driving instruction. You also have the flexibility to change the header or edit the text and apply a theme to your event landing page and online registration form. 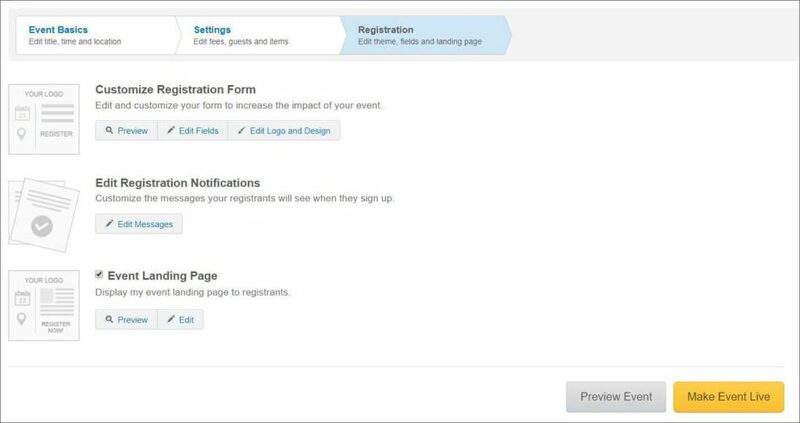 You can now either start emailing to your mailing list to invite registrants to register or share the link of the registration form in social media to drive traffic directly to your event registration page. 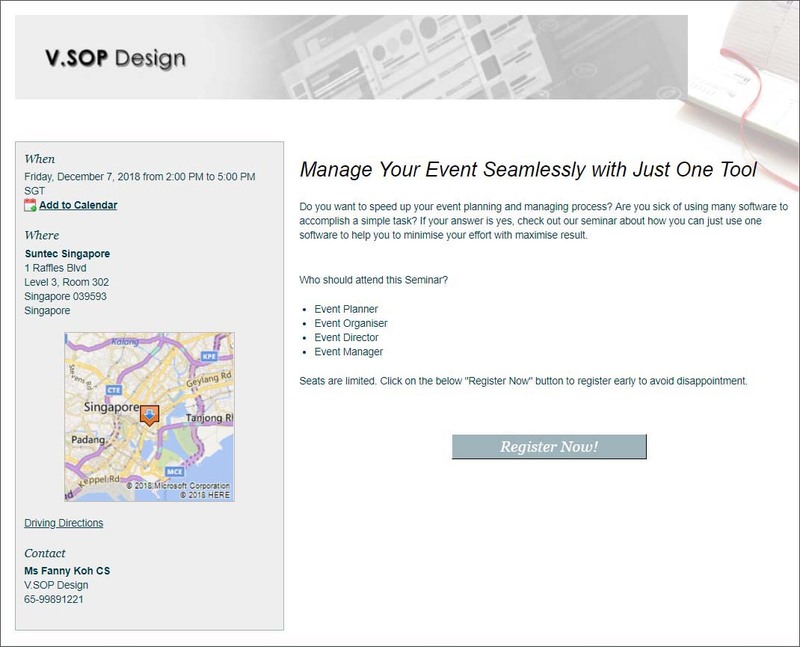 The email event invitation has three options for the event registrants to choose. They can either get more information from the event landing page or choose to register for the event or click on “I can’t make it” to decline the invitation. The event registrants can also sign up again if they change their mind later. This automation process is powerful as it frees you the hassle of constantly keeping track and register for the event registrants manually. 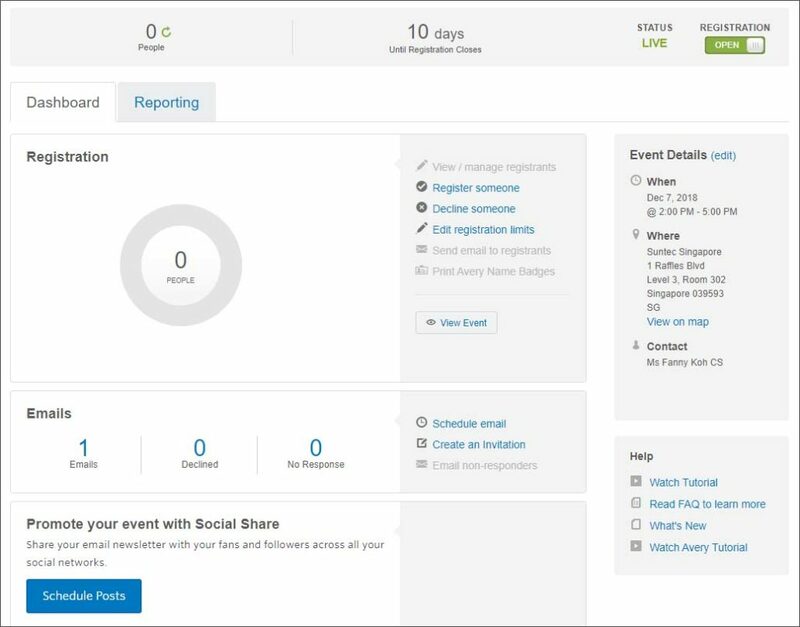 Another benefits of using this system is everything is integrated and allow you to see the result of event registration at the dashboard once you send out your email invitation, see below dashboard. The data shown on the dashboard allows you to take action immediately if the open rate or signup rate is poor. You can still tweak and adjust your email copy before the event ends. The above survey templates will save you massive amount of time as you do not need to crack your head to write the survey questions one by one and export the result to spreadsheet. The survey in Constant Contact consolidates the final results and display in the dashboard for you. You can either share the link of the report with your management or export as PDF document. To try out the benefits of the event registration as mentioned above, you can sign up a trial account at Constant Contact for free for 60 days. No credit card is required for trial signup.